21st Nov, Wednesday, at Chattogram a large colourful rally known as Jashne Julus obserbed. 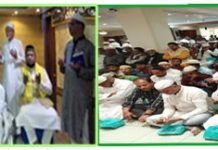 It was organized by Anjuman-E Rahmania Ahmadia Sunnia Trust on the occasion of Eid-E Miladunnabi (D.). Under the leadership of Awlad-E Rasul (descendant of Prophet), Hazrat Syed Muhammad Hamid Shah around 40 Lac muslims seem to be attended the rally. As per Chattogram people’s i dea it is world largest & colourful religious rallly on the occasion of birthday of our Prophet. Alhaj Sufi Mizanur Rahman spoke as the chief guest, while Moinuddin Khan Badal M.P. and CDA Chairman Mr. Abdus Salam spoke as special guest. Anjuman Trust SVP Mr. Muhammad Mohsin thanks the Prime Minister and the govt, respective officials, local govt offices, charge as Chattogram City Corporation, WASA, WAPDA, Police and Civil Administration for helping to observe the Julus smoothly and spontanously. Among others, Mr. Anwar Hossain, Trust Secretary General and Alhaj Pyar Muhammad, Chairman- Gausia Committee also spoke on the occasion. পূর্ববর্তী নিবন্ধপ্রশ্নোত্তর: নবী করীমের সঠিক ওফাত দিবস কত তারিখে?